What to measure to make your marketing effective. We recently discussed that both quality and quantity matter when it comes to metrics. Farmers and the ag industry have unique needs and spend considerably more time in the field than their counterparts outside of ag. The various types of metrics to collect are more objective and are intended to provide data that can enable you to better provide the ag community exactly what it is seeking. 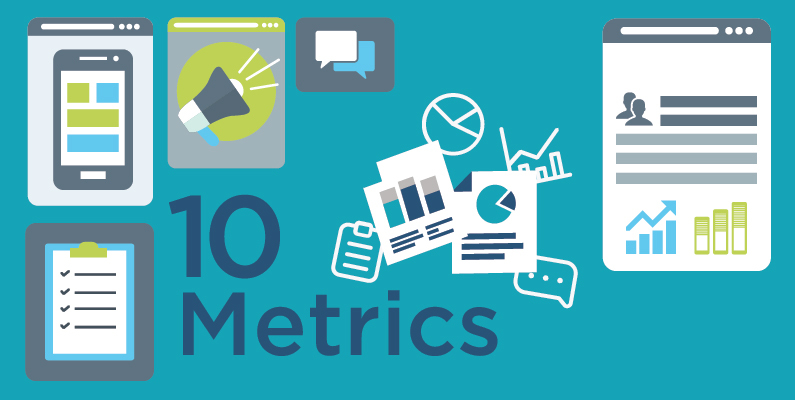 We have looked at multiple sources, including Forbes, Inc., Curata and Meltwater, and determined the top ten metrics to be the following. The metrics encapsulated here are specific to the various social and traditional media sources that ag agencies might use, and are reflective of how we think farmers, agronomists, veterinarians and other ag professionals would be engaging with them. 1. Website/webpage views. Here we’re looking at the most important overarching data, the number of visitors to a particular website or webpage. This may also include the amount of time spent on each page and the number of pages per visit, if it’s in reflection of an entire website. 2. The click through rate is a ratio of the number of viewers that have clicked on a link, in comparison to the total number of viewers of that page, ad, email or website. 3. The Bounce Rate is how long individuals attend to a website and stay on that site OR leave it for another site. It’s important to consider the reasons that individuals leave a site, whether it’s that they are unable to find the content they are seeking or they simply aren’t interested in what the site has to offer. 4. Domain Authority is a metric that refers to a website’s ranking and how that site compares to others. Browsers such as Google and Bing are good indicators for website visibility and accessibility. 5. You might think of mentions as the “word on the street” about your company or organization. In other words, mentions are your reputation in print, online and in the broadcast capacity. All of this can be captured by various media monitoring services that cater to ag. Keep in mind that mentions are also captured in real time for online audiences on social media and should be responded to accordingly, appropriately and in a timely manner with your customers. 6. Your email list is a metric that can be quantified and a golden ticket to potential leads. Why? These are the individuals who have subscribed to you and are therefore in what might already be considered a consumer relationship with you. 7. It’s not enough to just have an email list – measuring the emails opened is another significant metric, to help determine if there is further engagement possible or if the emails were received and then deleted. 8. The referrals that come in from various mediums, through your website, social media and word of mouth, are considered referral traffic. This is the best kind of traffic jam to be in, the one where there are so many referrals, you need someone to manage them! 9. Engagement is the all-consuming term to refer to all of the interaction between your organization and the greater community on social and traditional media. This includes emails, comments, likes, shares and any other types of communication. 10. The data that social media is capable of collecting is fascinating. As marketers, it enables us to expand our social reach or the total accessible population across all social media platforms. In the end, this informs us of our audience, demographics, and their consumer habits and interests. Behind the creativity, metrics shape the field of marketing and how it’s done. It’s to our advantage to use them as a guide, to better understand ag audiences and strategically and successfully build around that frame.